Product information "Pmod BLE Bluetooth Low Energy Interface"
The Digilent Pmod BLE is a powerful peripheral module meant for use with any UART enabled development board. This Pmod employs the Roving Networks RN4870 to create a fully integrated Bluetooth Low Energy interface. This chip features an onboard Bluetooth stack that makes connecting and communicating with any Bluetooth 4.X device possible through simple UART commands. The RN4870 also features four built-in GATT services: Device Information, Airpatch, BeaconThings, and UART Transparent data streaming. It also allows up to five custom public services and up to four custom private services, each allowing up to eight custom characteristics. 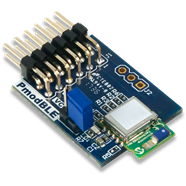 The Pmod BLE is an affordable, versatile, low energy addition to the wireless Pmod library. Related links to "Pmod BLE Bluetooth Low Energy Interface"